Germany's industrial orders rebounded in May with a 2.6% rise after a 1.6% decrease in April and a string of four straight monthly declines. Domestic orders jumped by 4.3%, nearly recovering April's 4.4% decline. Foreign orders rose by 1.6% in May, marking the second increase in a row but still not compensating for March's 2.9% drop. For the headline series, real seasonally adjusted orders are still in a contracting mode from 12-month to six-month to three-month, as orders progressively slow then decline. Foreign orders follow that same progression. Domestic orders are more solid. They show no declines and while they do slow from 12-month to six-month, the three-month growth rate of domestic orders is the strongest of the lot at a 5.1% annual rate. Real sector sales show the strength of domestic orders as its progression actually gathers pace and shows acceleration with most of the gains made on the back of the recent three-month growth rate. Consumer goods sector sales are flat overall, but its battle to neutrality between accelerating durable goods sales and decelerating nondurable goods sales. That split makes the sector assessment harder to categorize. Capital goods shipments showed an unusual decline in May, but on its progressive time span capital goods orders still are accelerating with three-month growth at an annualized pace of 6.7% despite May's decline. Intermediate goods show all positive growth rates from 12-month to six-month to three-month, but there is also a slight deceleration in the mix from 12-month to six-month before the three-month growth rate spurts sharply higher. The quarter-to-date total shows that growth rates both foreign and domestic declining in Q2 with two of three months' data in hand. But the real sector sales are making very small gains over the same span. The orders data suggest that overall orders are weak based on foreign demand while the domestic portion of orders is more solid. That is despite relatively modest readings for the German domestic services sector (more on this below). Even so, Germany is still grappling with its domestic agenda and stance toward migrants, a conflict that has undermined Angela Merkel's coalition from its early days. At the same time, the U.S. is imposing tariffs. And while many are still looking for a way out, some members of President Trump's team have said that there would have to be some actual pain before the U.S. would be able to get the deal it seeks. That suggests that the actual imposition of tariffs will be unavoidable and that we will walk through that minefield. Meanwhile, the geopolitical background is still hot as two more U.K. citizens seem to have become collateral damage to the Russia nerve agent attacks that targeted a former Russian spy and his daughter earlier. The U.K. is demanding help from Russia to deal with the new contamination and Russia is stone walling the request continuing to deny that it was the perpetrator. And fighting continues in Syria with Russian ‘advisors' helping Hezbollah troops in action. That, of course, will keep the flow of migrants streaming out of the Middle East across the Mediterranean Sea. It will continue to keep European politics wrong-footed and Europeans angry at one another over the issue. While the recent Markit PMI surveys have been solid, German orders flag some slowdown. 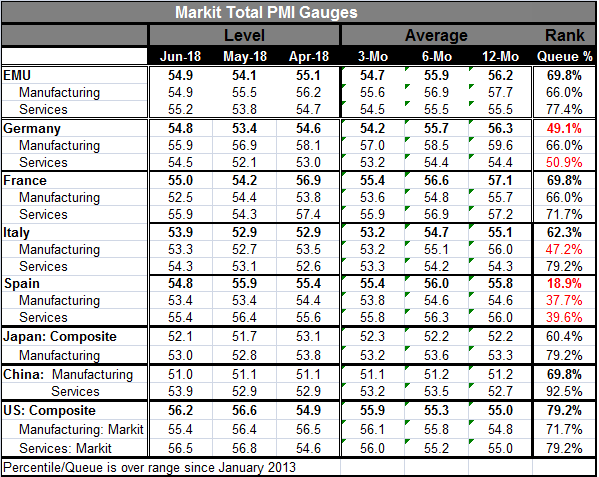 The PMI's below show a somewhat mixed view of selected global performance. German services remain weak. There is some weakness elsewhere in the EMU as Spain now is showing some joint weakness in manufacturing and services. Italy is a middle ground case with a below median manufacturing sector and yet a somewhat firm services sector. France has lost its earlier luster but continues to show growth. In Asia, both Japan and China are moderate with China showing a ‘strong' service sector ranking but only in comparison to its recent weak past (its service raw diffusion readings are not impressively strong). The U.S. is evaluated here using gauges provided by Markit and it is moderate, but it would appear stronger using ISM data. What we see here is evidence of a slowing having occurred. How much U.S. tariff talk and central bank saber rattling have affected things is hard to know. But there is a clear slowing and therefore more reason for central bankers to proceed with greater caution.